The Scorpio Solar Festival always signals a transformative time of year. Winter is coming, and wherever we have lived in America -- in the inland San Francisco Bay area, the northeast of the US or even here in South Florida, people are about to experience the first nights of cool or cold weather, even frost in the northern climes. Most of the local farms’ root crops have now been taken into the barn. This is the time of year when inhabitants of farming societies in the Northern Hemisphere traditionally measure the state of their stores against the projected winter need of animals and community members. And this is the traditional time for alchemical transformation of foods, when canning, freezing, and processing for winter food storage must be completed. Prior to the industrialization of agriculture, the ability of a farmer or householder to “put by” foods for the cold season could spell the difference between Thanksgiving Feast and eventual famine. When a farmer had an overabundance of a particular crop, such as cabbage, cucumbers, Swiss chard, turnips, or squash, it was vitally important to preserve the surplus for consumption in the dead of winter. Natural fermentation processes of various kinds have been utilized by farmers around the world for thousands of years for this purpose. Successful fermentation of vegetables depends upon the vitality of the soil in which they are grown. Vegetables that have been chemically fertilized or treated with chemical insecticides do not have the same capacity to produce the beneficial bacteria required for proper fermentation. 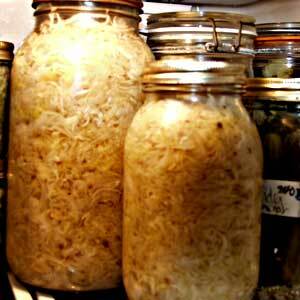 When we lived in upstate New York, on Roxbury Road, neighbors gathered at the off-the-grid Solar powered home of Betsy Cashen and Chris Stearn to make sauerkraut through an ancient, artisanal process called lacto-fermentation. Here’s our good friends and neighbor’s recipe for production of Sauerkraut, and a pictorial essay of Sauerkraut Production. Lacto-fermentation preserves foods without recourse to canning or freezing. During the simple fermentation process, lactic acid, a natural food preservative, is produced by the putrefaction of bacteria commonly found on leaves and plants of various kinds of food crops. Over 3500 traditional, fermented foods exist world-wide, including miso, alcohol, wines, beer, yogurt, quark and the original recipe for ketchup, but here in the Hudson Valley, sauerkraut is one of the most celebrated. The traditional method for making kraut was practiced in Roman times, and was mentioned by the Roman historian Pliny. Scientific studies have shown that daily consumption of lacto-fermented vegetables helps in reestablishment and maintenance of beneficial intestinal flora, and aids immune function. Raw fermented vegetables aid digestion, relieve constipation and are associated with decreased allergies and infections. Sauerkraut is not made with sugar, vinegar or sodium benzoate. Nor does it need to be canned or pasteurized. If you are shopping for sauerkraut in a store, be sure not to buy any that has been canned or pasteurized, because these industrial food processing techniques destroy the valuable enzymes. Cabbage is pounded and mixed with salt to promote the growth of lactobacilli. Salt draws water out of the cabbage, creating brine, in which the cabbage will ferment and sour without rotting. This promotes the creation of lactic acid. The bacteria in the mixture feed on plant sugars in the brine, and proliferate wildly. Once mixed, the cabbage must be tightly packed into an airtight container and left to ferment at room temperature for a period of time. When completed, the sauerkraut is ready to be placed in cold storage. This is the alchemy of food, which traditionally takes place at the time of the Scorpio Full Moon. Relatively undigestible raw cabbage, which corresponds to the raw substance of the human personality, is transformed through lactofermentation rituals into pure nutritional gold, a relatively long-lasting, extremely potent and nutritionally rich food substance that can sustain the community throughout the long dark nights of the winter season, when the plants die off and the Earth inhales long and deeply of the Cosmic Forces streaming in from the Stars. Interestingly enough, Scorpio is the Zodiacal sign that governs the alchemical process of fermentation or putrefaction. For the alchemists, who represent the Western mystery school tradition, putrefaction represents the first in a series of transformative steps that result in the perfection of the psyche. Putrefaction is the “black step” ruled by Saturn and by Scorpio, when the alchemical material, the initiate’s psyche, is decomposed into its various constituent elements, air, water and earth, or the mental, emotional and physical bodies. 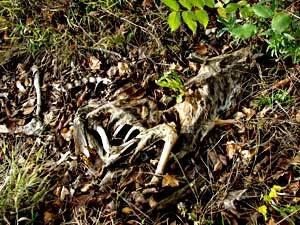 The putrefaction process is thus analogous to the process of Death, whereby the physical body decomposes into its various constituent elements. On a psychic level, putrefaction represents the “Dark Night of the Soul”, when repressed memories, karmic debris and psychic blockages rise to the surface prior to a process of releasing. According to the ancient wisdom teachings of the Hindu Vedas, “Born of the Earth, man, when he dies, returns to his mother.” This corresponds to the Jungian conception of Death – the atomization of the personality and the return of the energy contained within that personality to the collective unconscious. The concept of Death as part of the transmigration of souls in a process of reincarnation first surfaced during the dawn of agricultural society, when humans first conceived of a cycle of death and rebirth, linked to their understanding of the seasonal cycles of cultivated plant growth. It is only by conscious realization of the ultimate unity of all reality, both immanent and transcendent, that one gains release from the eternal cycle of reincarnation. It is only through conscious identification of the individual soul (Atman) with the transcendent energy that sustains and vivifies all of creation (Brahman) that one obtains enlightenment. This goal of enlightenment corresponds to the ultimate goal of the alchemists – to turn the lead of the egoistic personality into the gold of Divine Consciousness. The wisdom teachings of the alchemists were captured in the pictorial tradition of the Tarot cards. Tarot Trump 13, called Death, refers both to physical death and to the death of the egoistic personality, which is an illusory death. For the personality remains after this death, but it is stripped of the illusion of control. The aspirant no longer lives to satisfy individual material desires at the expense of others, or without thought for the consequences of actions upon the larger Web of Life that comprises the great Karmic Wheel of Existence figured in Tarot Trump 10, The Wheel of Fortune. This Scorpio Solar Festival is the time of Cosmic Transition when we stand poised at the edge of the Watery Abyss, and when we plunge into that Universal Womb from which we came. This is the season of the year when we can all begin to make substantial progress in our inner work. The darkening of the light outside corresponds to increasing light within. Now is the time to rededicate ourselves to our spiritual practice, and renew our efforts to transform our own inner raw materials into gold. May you each enjoy a profound personal transformation during this most auspicious time of year, and may your own personal fermentation result in the production of a fruitful new life of spirit, moving you ever closer to Union with the Divine. We fondly remember Chris Stearn, our dear friend mentioned in this article who has himself crossed the threshold. His daughter & Betsy continue their tradition of making saurkraut at this time of year. We hold him in our hearts, remember his wonderful smile & love of the alchemical transformation of vegetables into nourishing food!